You're a single parent of five children under the age of 17 but none of them play rugby league at the moment. Would you manage a local team and become club secretary? You wouldn't be paid for the role. And you would have to spend your own time ensuring an entire junior rugby league club is run smoothly. Well for Belinda Prakhounheuang, this is her story. 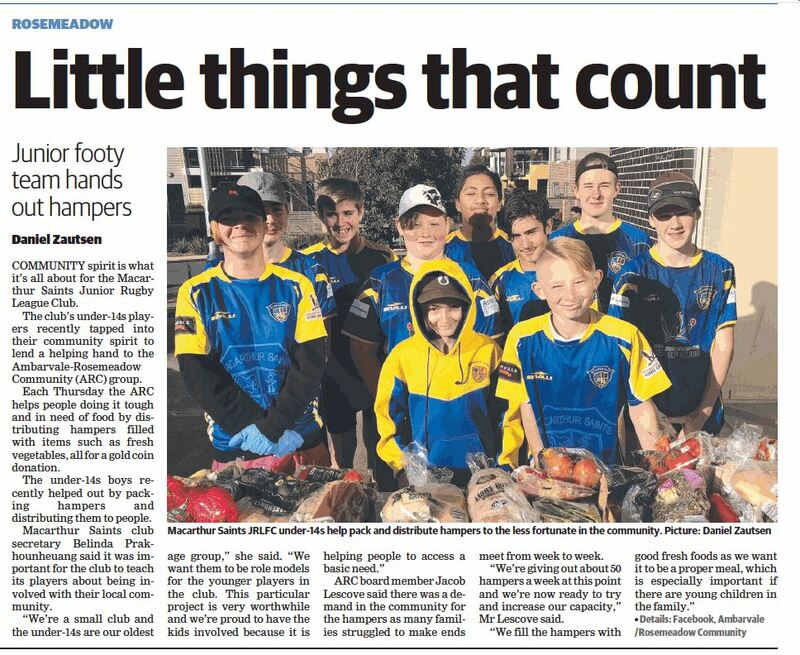 The Macarthur Saints club secretary has worked at the junior rugby league club for over a decade but in 2016 her son decided to stop playing. But that didn't mean Belinda had to stop. "I became a bit like a mother hen and got emotionally attached to the all players in the team," she told NRL.com. "I just couldn't walk away when my boys gave it away. I've made so many great friends over the years and I'm now invested in the club – from the young kids to the older ones." Belinda stayed on and manages the under-17s side while taking the daily responsibilities of a secretary role. So how does she juggle it all with five children at home? "My back fence has a gate that goes through to the oval so my house is literally just next door to the ground," she laughs. "I can see the kids out there warming up, so that logistically makes it a lot easier for me. "But as a single mum of course, I am juggling with McDonalds shifts and girlfriends places all the time. "But the kids know on Saturdays and some Sundays that mum isn't available." No but seriously, how does one juggle it? Early starts and late finishes on the weekend that includes setting up the field, taking care of paper work and organising team photos or end of season presentation nights. "As a mum when you've got five kids you're used to juggling and multi-tasking in a different way anyway," she says. "All my kids pitch in. There are times when I think I'm tired or need a break and I think everyone gets like that, but the reason you do it is not for pay or recognition, you do it for the enjoyment. "That's my motivation to keep going with it. Our club has about 196 kids but you get to know each one and the families along the way." And what happens to the youngest child, one-year-old Max? "He has an assistant secretary badge that he wears around the ground very proudly," Belinda laughs. "He loves football and I have great helpers that take him throughout the day as well. I usually end up with a tab at the canteen too as my 10-year-old will demand a bacon and egg sandwich as soon as he wakes up and comes over from the house. "But I always give in because the guilt kicks in for spending time away from the kids in what can be a very long day. When I'm home though, it's family time." "There is no off-season. If you don't get something out of it then you wouldn't think twice to do it. "While paid employees at jobs have baulked at the possibility of penalty rates being cut on weekends in Australia, volunteering at local sporting clubs across the nation has gone on for decades. And not even at a discounted rate, but at no rate. "As a parent coming through the ranks, some of them have no idea what running a football club is like," Belinda said. "Sometimes I think they believe we just turn up and everything is done with fields set up and magically packed away, or the amount of time that goes into it - from small board meetings to make simple decisions about how things are getting run or the financial side of things. "It's definitely something that when I first went into the role I never thought it would be and someone first said it's a 24-hour a day gig and I just laughed. "But it literally is, there is no off-season. If you don't get something out of it then you wouldn't think twice to do it." The story gets even more inspiring. Earlier this season Belinda was given one of the toughest tasks in life – telling the under-13s side that their coach – a well-respected mentor around the club – had passed away suddenly that morning. While the side were waiting for their coach to arrive, Belinda was preparing to deliver the news. "It was just horrible and the worst thing I've ever had to do," she recalls. "Looking at those boys in the eye and telling them their coach had passed away after they only just saw him a couple of days earlier… it was just tragic. "But it in the end when you're put in the position, I was with no notice, I just had to think as a child how would they need to hear that. "As a club it was a hard way to start the season but it shows the strength we have when things like that happen and it reinforces the feeling of community for me." By now you can understand what Belinda has brought to the game in Sydney's South West and why she was the first person nominated by the Wests Tigers to be recognised in Women in League Round. Her dedication and hard work to the Macarthur region is deservedly acknowledged. "It's definitely nice to get that official recognition, I got a card in the mail from Laurie Daley to say 'thanks for all you do' and that really meant a lot," she said. "I as much as everyone love that rugby league is rough and physical but I think that the 'old boys' mentality is now in the past. "Women have a lot to offer and in my experiences as a mum it's given me a different perspective on things. I think and make decisions on the back of what a parent would think in response. "It doesn't make the game any softer or worse, it enhances it and encourages girls to chase those female roles in the future too." In another boost for the club, the Macarthur Saints have entered their first ever girls team this season and are hopeful of more growth in the future. "They had their first ever win last week and you would have thought they won the grand final," Belinda laughed. "As a club we were excited to see them happy and that to me just reminds me why I am here. "I get just as much thrill watching our under-8s go out onto the field of Campbelltown and form a guard of honour for the Wests Tigers boys. "And then see the kids looking up at Aaron Woods and thinking 'oh my gosh!' or coming off the field saying how soft the grass is. "All those moments make up for the late nights of sitting up and writing out emails or up at 6.00am for game day and that's why I keep coming back." There is no doubting that rugby league is lucky to have you keep coming back, Belinda. It is with a very heavy heart that I write this post tonight...as many of you are aware our club suddenly and unexpectedly lost an amazing coach, a beautiful man and a wonderful friend earlier today. Craig Cloos was the kind of man you want to have in your football club, he had a huge passion for the game and he genuinely loved every one of the kids he took under his wing. I found out today just how many lives he had touched at our club and his smiling face will be sadly missed around Oswald Oval. ​Macarthur Saints would like to express our condolences to Craig's family and friends during this difficult time and please know you are in our thoughts and prayers. Although today was a very difficult and emotional day at our club I am incredibly proud of our Mac Saints family, especially Cloosy's under 13's, and the way they handled themselves.